And now the rotating service structure has arrived in its enclosure position around Discovery. Concluding this long day of fueling test activities, the mobile gantry is moving to encapsulate Discovery once again. The orbiter will be hidden within the structure for the weekend, then unveiled on Monday during final steps for rollback to the Vehicle Assembly Building. Draining of liquid oxygen and liquid hydrogen was completed just before 5 p.m. EST. But it will be tomorrow before all the residual hydrogen boils away and the tank is inerted. Data from temperature sensors attached to the skin of the shuttle Discovery's external tank closely matched predictions from computer models, engineers said Friday as a critical fueling test drew to a close, and no unusual stresses were noted from strain gauges on or near structural ribs, or stringers, that cracked during a Nov. 5 launch attempt. Attention now turns to the Soyuz TMA-20 capsule nearing the International Space Station for docking at 3:12 p.m. EST. See our live coverage. Cutoff. This day-and-a-half countdown sequence to fuel the space shuttle Discovery and collect data about the external tank's performance during cryogenic conditions has run its course. The launch team is beginning standard safing procedures and will start draining the liquid oxygen and liquid hydrogen from the tank a short time from now. The pad's service gantry is scheduled for rotation to enclose Discovery at 10:30 p.m. EST tonight. Preparations for the shuttle's rollback to the Vehicle Assembly Building will get underway this weekend. The 6-hour trip from the pad to the VAB is tentatively planned for the predawn hours on Tuesday morning. Once back inside the assembly building, workers will gain access to the backside of the external tank for digital X-rays not reachable at the launch pad. The full 360-degree survey of the tank's ribbed midsection will further NASA's work to clear Discovery for launch in February. The next launch window opens on Feb. 3. If this was a real launch attempt, the auto sequence start occurs as the countdown passes T-minus 31 seconds. That's the handoff point from the Ground Launch Sequencer to the space shuttle for Discovery's computers to take control. T-minus 31 seconds and holding. The clocks have been stopped as designed following this rehearsal of the terminal countdown and pressurization of the external fuel tank. The shuttle will remain in this flight-like condition for five minutes before the launch team cuts off the countdown sequence. T-minus 1 minute and counting. T-minus 1 minute, 57 seconds. Replenishment to the flight load of liquid hydrogen in the external tank has been terminated and tank pressurization is underway. T-minus 2 minutes, 25 seconds. The gaseous oxygen vent hood is being removed from atop the external tank. Verification that the swing arm is fully retracted will be made by the Ground Launch Sequencer at the T-minus 37 second mark. T-minus 2 minutes, 50 seconds. The external tank liquid oxygen vent valve has been closed and pressurization of the LOX tank has started. This is part of the continuing test efforts to put Discovery's external tank through its paces today and gather data on the loads and stresses experienced in the countdown. T-minus 4 minutes, 55 seconds. Replenish of liquid oxygen to the external tank is being stopped. The tank has been topped off continuously since fueling was finished this morning, replacing the cryogenics that naturally boil away. T-minus 5 minutes. Normally this is the point when the Auxiliary Power Units are started for orbiter hydraulics. But that is not necessary today. T-minus 7 minutes, 30 seconds. The Ground Launch Sequencer won't be retracting the orbiter access arm away from the port side of the vehicle. In fact, Discovery's hatch has remained open for this test. T-minus 9 minutes and counting! The Ground Launch Sequencer has been initiated to control the remainder of today's tanking test countdown. The master computer program is located in a console in the Firing Room of the Complex 39 Launch Control Center. T-minus 9 minutes and holding. The countdown has entered the final 10-minute planned built-in hold. Once the clock comes out of this hold at 2:11 p.m. EST, the final phase of the test countdown will be underway toward pressurization of the external tank. T-minus 20 minutes and counting. Clocks are running once again, now headed down to T-minus 9 minutes for the next hold in the countdown. T-minus 20 minutes and holding. The countdown has entered the 10-minute planned built-in hold. NASA has revised the precise launch time for Discovery's potential Feb. 3 liftoff by a minutes. The new time is 1:37 a.m. EST (0637 GMT), the moment that the International Space Station's orbital plane and launch pad 39A are properly aligned. Discovery would dock to the station on Feb. 4 at about 9:43 p.m. EST, the mission spacewalks occur the nights of Feb. 6 and Feb. 8, with installation of the new Permanent Multipurpose Module on the in-between day. Undocking comes Feb. 11 at 4:42 p.m. EST, setting up for landing back at the Kennedy Space Center on Feb. 13 around 8:41 p.m. EST after a mission lasting 10 days, 19 hours and 4 minutes. T-minus 1 hour and counting. Two planned stoppages are upcoming, both lasting 10 minutes in duration, at the T-minus 20 minute and T-minus 9 minute points. Discovery stands loaded with 500,000 gallons of cryogenic liquid oxygen and liquid hydrogen while an extensive suite of sensors attached to the external tank's skin precisely monitors the response to filling and draining the supercold propellants. The simulated launch countdown also includes pre-liftoff pressurization of the oxygen and hydrogen reservoirs. Knowledge gained from the test and later inspections of the tank's midsection will pave the way for getting Discovery ready to launch in a couple of months. No problems have been reported thus far today. And the team just arrived at the staging area in the parking lot next to the KSC press site. The Final Inspection Team has completed its work at launch pad 39A. The 8-person team just departed the seaside complex, en route back to brief managers on their findings. The Final Inspection Team has made its way down to the mobile launch platform's surface as the work goes on. T-minus 2 hours and counting. Check out this YouTube video of the fueling test preparations. The team is on the lookout for any abnormal ice or frost build-up on the vehicle and integrity of the external tank foam insulation after the loading of cryogenic liquid hydrogen and liquid oxygen propellants this morning. They also have a special telescope in hand today for this tanking test to get detailed views of the foam. T-minus 3 hours and counting. Clocks are ticking again after the programmed hour-long hold. The countdown will proceed to the next planned paused at T-minus 20 minutes beginning at 1:40 p.m. EST. Read our update story on the progress of today's test. The Final Inspection Team is out at the launch pad to scan the vehicle for any ice or debris concerns following fueling operations. The team has an 8th member as part of the group today for this special fueling test. The team is comprised of engineers and safety officials from NASA, United Space Alliance and tank-builder Lockheed Martin. At the conclusion of their tour-of-duty, the team will have walked up and down the entire fixed service structure and mobile launcher platform. Official conclusion time for tanking was marked at 9:59 a.m. EST. Everything is going very well so far today. The team just took the elevator up to the 255-foot level of the tower to begin its work. The Final Inspection Team has arrived at pad 39A. The team members are unpacking their gear now. FUELING COMPLETE. Liquid oxygen tank has been placed in stable replenish, completing the three-hour fuel loading process for space shuttle Discovery. But today's test is not done. The Final Inspection Team is heading to the launch pad to observe the external tank foam up-close for any signs of problems after fueling. Also, the countdown will continue to T-minus 31 seconds and see the tank fully pressurized for flight just like a real launch attempt. T-minus 3 hours and holding. The countdown has gone into the next planned built-in hold. This one will last for 60 minutes. Still targeting a 2:20 p.m. mock T-0 today. The 89 special sensors attached to the external tank are gathering the strain measurements and temperature readings during fueling. "We're getting great data from the tank," launch director Mike Leinbach says. The liquid hydrogen loading went through the topping phase and reached the stable replenishment condition at 9:28 a.m. EST. Engineers have not detected any abnormal gaseous hydrogen leakage today, unlike the earlier countdown last month. The repair efforts to overcome a subtle misalignment between the external tank and venting system has worked. All is going well two-and-a-half hours into the fueling operations for space shuttle Discovery. No adverse gaseous hydrogen leakage has been seen in the ground umbilical carrier plate hardware. Shuttle Discovery's external fuel tank foam also looks good so far during today's instrumented fueling test. The liquid hydrogen tank reached the 98 percent level at 8:56 a.m. EST and the transition to topping mode is beginning. Meanwhile, the liquid oxygen tank is two-thirds full now. Loading of space shuttle Discovery's external fuel tank continues at launch pad 39A. The big milestone coming up will be the transition of liquid hydrogen loading into the topping mode around 9 a.m. EST. That is when the vent valve is fully opened and the ground umbilical carrier plate completely chills, a point in which the gaseous hydrogen leak has occurred during previous shuttle launch attempts. If the repairs from the Nov. 5 leak have worked, the system will remain good and tight today. Just over the 90-minute mark in today's fueling. The liquid oxygen tank is about one-third full and liquid hydrogen is two-thirds full. This type of fueling test is a rarity for the space shuttle. Over the history of the program, officials have sparingly ordered shuttles be loaded with cryogenics to check for leaks or examine the performance of hardware. NASA has conducted about a dozen special fueling tests in the past three decades beginning with the very first mission, STS-1, back in 1981. The first flight after the Challenger accident, STS-26, also underwent a fueling exercise in 1988. The pair of missions plagued by hydrogen leaks -- STS-35 and STS-38 -- had six special tanking tests to troubleshoot the problems and later verify the issues were fixed in 1990. STS-91 debuted the new external tank design and had a pre-flight checkout with the cryogenics loaded aboard in 1998. The first flight after the Columbia accident, STS-114, had two fueling tests in 2005. And STS-127 last year was fueled to ensure repairs to the gaseous hydrogen umbilical were successful. Liquid hydrogen loading switched to the "fast-fill" mode at 7:49 a.m. EST as fueling of space shuttle Discovery proceeds via remote control at launch pad 39A. Liquid oxygen completed the chilldown thermal conditioning process and the loading moved into the slow-fill process. The fast-fill mode began at 7:50 a.m. EST. The fueling sequence started with the chilldown of the liquid oxygen system at 7:00 a.m. EST. The transfer lines on the liquid oxygen side will be chilled down, then the main propulsion system conditioning is completed. The liquid hydrogen loading transitioned from the chilldown thermal conditioning process to the "slow-fill" mode at 7:12 a.m. EST. This fills a small fraction of the tank, then the loading switches to "fast-fill" mode. 07:45 AM...Hydrogen engine cutoff sensors "wet"
FUELING UNDERWAY. Filling of space shuttle Discovery with supercold liquid hydrogen and liquid oxygen rocket fuel has started for this knowledge-building test on the external fuel tank's performance under cryogenic conditions. The instrumented test involves 89 special sensors to gather data on the stresses that the tank experiences during fueling. The shuttle will be returned to the Vehicle Assembly Building next week for thorough inspections of the tank's midsection to ensure there's no cracks in structural ribs like the ones repaired last month. T-minus 6 hours and counting. The countdown has resumed ticking after a one-hour hold. The next scheduled built-in hold will occur at T-minus 3 hours and last for 60 minutes. Additional 10-minute pauses are planned later today at T-minus 20 minutes and T-minus 9 minutes. The test culminates with external pressurization and stopping the clocks at T-minus 31 seconds around 2:20 p.m. EST. Fueling should be getting underway shortly. The Mission Management Team met for the pre-fueling meeting and granted approval to load a half-million gallons of supercold rocket fuel into Discovery's external tank. The latest forecast for today's test gives a 100 percent chance of acceptable weather. The fueling time outlook includes just a few clouds at 3,000 feet, good visibility, southwesterly winds of 12 gusting to 17 knots and a temperature of 52 to 65 degrees F.
T-minus 6 hours and holding. The countdown has gone into the scheduled one-hour built-in hold prior to the start of fueling. The Mission Management Team is scheduled to convene its pre-fueling meeting at 6:30 a.m. EST. Engineers working through a modified shuttle launch countdown are preparing to pump a half-million gallons of supercold liquid oxygen and hydrogen rocket fuel into the shuttle Discovery's external tank Friday to collect data needed to assess the tank's structural integrity in the wake of cracked ribs, or stringers, found after a Nov. 5 launch attempt. Read our tanking test preview story. On the evening before the external tank fueling test, the space shuttle Discovery has been unveiled from the cocoon-like service gantry at Kennedy Space Center's pad 39A. Technicians will spend the rest of this evening and the overnight hours getting ground equipment configured and secured in preparation for tomorrow's fueling with supercold rocket propellant. Inside Discovery's cockpit, meanwhile, support personnel will verify switches are in the correct positions for the test. Clocks will resume counting at 1 a.m. EST after the hold at T-minus 11 hours. The next planned hold is T-minus 6 hours beginning at 6 a.m. EST. During this one-hour pause of the clocks, the Mission Management Team convenes its pre-fueling meeting at 6:30 a.m. to review the status of work, the readiness of shuttle systems and the latest weather forecast. If all goes according to plan, loading of the external tank with propellant will start at 7 a.m. EST. The process should take three hours to complete. Join us here in the Mission Status Center for live play-by-play updates throughout the day. The structure is nearing its fully retracted position. Particularly visible is some of the special instrumentation wiring that's draped along the front face of the external tank. Rollback of the rotating service structure to reveal shuttle Discovery has begun at launch pad 39A. Engineering walkdowns of the launch pad are being performed and observers will report on station in a little while for gantry rollback. First motion of the tower is expected around 9:30 p.m. EST. You can watch it live in our streaming video. T-minus 11 hours and holding. The tanking test's countdown has entered the first in a series of planned built-in holds. This pause is scheduled to last for 6 hours, with the clocks resuming at 1 a.m. EST. Coming up later this evening, the rotating service structure will be retracted away from the space shuttle to reveal Discovery for tomorrow's fueling exercise. Inside Kennedy Space Center's launch control room, the countdown has begun ticking for Friday's unique test on space shuttle Discovery's external fuel tank. Teams gathered at 8:30 p.m. and started the clocks ticking at 9 p.m. EST from the T-minus 33 hour mark. 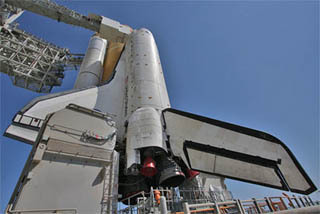 The next day-and-a-half will be spent readying the space shuttle and launch pad 39A for Friday morning's fueling test. Pre-programmed holds are planned at various points in the countdown, ultimately leading to the start of fueling operations Friday at 7 a.m. EST. The count will continue all the way to T-minus 31 seconds around 2:20 p.m. EST. The built-in holds are slated to occur at the T-minus 11 hour, T-minus 6 hour, T-minus 3 hour, T-minus 20 minute and T-minus 9 minute points. Discovery will be loaded with 500,000 gallons of cryogenic liquid oxygen and liquid hydrogen while an extensive suite of sensors attached to the external tank's skin precisely monitor the response to filling and draining the supercold propellants. The simulated launch countdown also includes pre-liftoff pressurization of the oxygen and hydrogen reservoirs. Two structural ribs on the tank cracked during fueling on the Nov. 5 launch attempt, causing the exterior foam to break. That put the mission on hold while engineers assessed what caused the problem and how to fix it. This test is part of those continuing efforts to understand the issue. Discovery will be rolled back to the Vehicle Assembly Building next week to enable full examination and X-rays of the tank's midsection, including the backside regions not accessible at the launch pad. The next available launch window for Discovery opens on Feb. 3 and extends through Feb. 10. The subsequent opportunity would run from Feb. 27 through March 6. This will be Discovery's 39th and final trip to space before retirement. The flight is carrying a stowage vessel, called the Permanent Multipurpose Module, and an outdoors spare parts pallet for the International Space Station. Foaming of the tank's special sensors has been completed at pad and approval has been given to start the countdown for Friday's fueling test on space shuttle Discovery. LIFTOFF of the Soyuz rocket carrying a crew from three countries to the International Space Station! A Russian Soyuz rocket is poised for launch Wednesday on a two-day flight to ferry three fresh crew members to the International Space Station. Liftoff from the Baikonur Cosmodrome in Kazakhstan is targeted for 2:09:25 p.m. EST (GMT-5), roughly the moment Earth's rotation carries the pad into the plane of the space station's orbit. Perched atop scaffolding erected on the launch pad's swing arm, workers are reaching additional areas on Discovery's external tank today to continue with fueling test preparations. This scaffolding was constructed atop the pad's intertank access arm that extends from the main tower to the external tank. It's a visually exciting worksite, to say the least, and high winds yesterday prevented the technicians from climbing up there. They will be marking the tank with thousands of dots for photogrammetry, a method of observing the tank's subtle movements during Friday's planned fueling test. Some 89 strain and temperature sensors have been attached to the tank's skin. Application of foam insulation over top the instrumentation is on-going. Completing that foaming and having suitable weather will determine if Friday's test can proceed as currently scheduled. Plans call for the countdown sequence to begin ticking Wednesday at 9 p.m. EST inside the Launch Control Center. The rotating service structure would be retracted away from Discovery on Thursday around 9:30 p.m. EST. Fueling of Discovery with a half-million gallons of supercold liquid oxygen and liquid hydrogen is targeted to start at 7 a.m. EST and take the usual three hours to complete. The inspection team then gets dispatched to pad 39A for extensive examinations of the tank and foam after fueling is finished. Clocks will tick through the final minutes of the countdown and see the external tank pressurized for flight, further adding to the data collected about the structural performance. A cutoff occurs around 2:20 p.m. EST at T-minus 31 seconds, followed by safing and the offloading of propellants. Rollback to the Vehicle Assembly Building is expected next Tuesday or Wednesday. Shuttle Discovery's external tank will be loaded with supercold rocket propellants as early as Friday in a critical test to help engineers understand what might have caused cracks in two structural ribs. After the test, the shuttle will be hauled back to the Vehicle Assembly Building for additional inspections and possible repairs. NASA has postponed shuttle Discovery's special fueling test by two days because of the cold and windy weather at the Florida spaceport has delayed the completion of preps. The test has been rescheduled for Friday. Weekend work completed the installation of strain gauges around the tank's ribbed intertank region. Efforts to attach thermocouples and covering the sensors with foam are on-going still. Check back later today for a full story. Technicians at launch pad 39A will be working throughout the weekend to outfit space shuttle Discovery's external tank with special instrumentation for next week's fueling test. Strain gauges and thermocouples are being installed at strategic positions within reach from available pad structures. The data collected will help engineers understand the stresses that the tank experiences when liquid hydrogen and oxygen are pumped aboard. NASA is hoping to conduct the so-called tanking test on Wednesday beginning at 7 a.m. EST (1200 GMT). However, cold weather forecast this weekend could slow preparations for the event. Managers plan to meet Monday morning to assess the progress of work and determine whether to start up the tanking test's countdown.